I finally got it right: connecting the global with the local. One of the few pieces I am happy with even after publication. Usually I go back and say– nah, wish I had said this instead of this; or wish I had said this better. 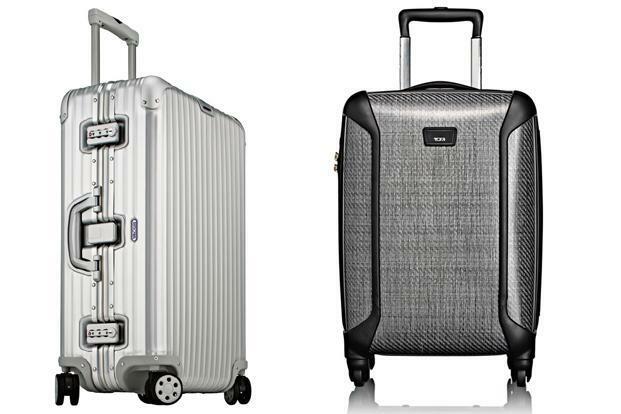 What your Rimowa (left) and Tumi say about you. I bought my first Tumi carry-on for the same reason that I bought branded objects in my misguided youth: to impress a guy, and to escape conformity. I was 20 and working as an intern at a television station. The man in question—my boss—seemed impossibly suave, with gelled black hair that was combed back in that shiny Italian style done so well by Andy Garcia in Ocean’s Thirteen. “Not really?” Really? That was the best I could do under pressure to impress? Boss-man travelled with a retinue of Goyard trunks and assorted camera equipment in unwieldy containers. I was one of the lackeys who performed the role that Tamilians called gooja-thooki, or in this case Goyard-thooki. Thooki means carry. I was, in other words, a baggage handler. The Tamil term gooja-thooki literally means “carrier of the water-carrier”, also known as gooja. It figuratively refers to a hen-pecked husband who carries his wife’s water bottle and is frequently used as a pejorative snarl as in, “That Venkatsubramaniam—he is nothing but a gooja-thooki.” Like most Tamil snarls, you get breathless by the time you finish pronouncing the name of the person you are snarling at. Like most ancient Tamil proverbs or phrases, this one too doesn’t make sense in the modern age when men carry their wife’s luggage or water bottle as a badge of honour, as a matter of pride. Not only that, women don’t carry goojas any more. How can you fit it in your Gucci handbag? I own a brass gooja, which is lovingly polished and displayed atop my antique munshi-trunk, bookended by two brass lamps. My grandparents used to travel with it on long train journeys across India. They also carried a giant tiffin-carrier and a “hold-all”, a cloth contraption that was as necessary to our train travels as the long stainless steel chain and lock that cost more than the “valuables” that we locked up. The hold-all was a marvellous thing. It was made of olive-green canvas cloth and would spread out like a sleeping bag or roll up like a chakli (savoury), or an earthworm that has been stung. On top was a pouch into which we fitted a pillow. In the middle, we inserted a razai (quilt), which served as a bed. The bottom pouch was immensely versatile and capacious enough for clothes, footwear, gifts, and even the odd coconut. We rolled it up and tightened it with belts and buckles. We lounged on it during the day and opened it out at night. The hold-all, in other words, was our version of the Goyard trunk. Vintage Goyard trunks open out into compartments for all sorts of things. You could put your baubles in one; your socks in another; your isabgol and Hajmola in the third, and so on. The French love Goyard because it is the oldest Parisian malletier or trunk maker. Delvaux, based in Belgium, has the heritage and pedigree and is more discreet to boot—there isn’t even a Wikipedia page on it. Moynat is another malletier, the only one established by a woman named Pauline Moynat. Louis Vuitton is the most famous of them all. I love these vintage European brands. I didn’t at first, and I still don’t like the way their monograms are emblazoned all over. Goyard’s “chevron” logo looks to me like busy ants are crawling all over the trunk—a particularly vivid image that comes from reading too much Kafka (the story where that guy metamorphoses into an insect) or watching black ants make a beeline for Lord Ganesha’s coconuts. Now that I am older and more knowledgeable, I like the fact that Goyard, unlike Valextra, the Italian luggage brand, doesn’t use leather for its trunks. It uses canvas, hemp and other stuff that practically reeks of the organic lifestyle that I try to emulate in the hope of being as chic as, say, Christy Turlington—she of the yoga poses, vegetarian diet and Sundari line of cosmetics. I wanted to emulate and impress my boss. Emulate is a nice verb; a gentler one that is softer on the ego than “copy”, which is essentially what it connotes. So I decided to copy his gender-neutral preferences. Since I couldn’t wear the slim-fit business suits that he favoured, I would buy a piece of the luggage brand he favoured. The only problem was that a Goyard trunk cost as much as my rent—for a year. The salesman at the store thought I had lost my way when I walked in. “I think you are looking for the Tumi store,” he said with that false-kind smile that snooty luxury brand professionals perfect. That was how I heard about Tumi. Tumi was affordable. Well, it wasn’t really but it only cost two months rent, instead of like a year’s worth. It also helped that the store was having a sale on carry-ons, which was how I became the proud owner of the smallest Tumi carry-on. It was shining, functional and was a gift “tumi” by me. Well, it was actually a gift “to him” from me, but he didn’t know that. You know what he said when I rolled in with my new carry-on? “You should have bought Rimowa,” he said. It was at that moment that I knew I stood no chance. It was at that moment that he crushed my crush. Shoba Narayan is searching for vintage hold-alls and considering monogramming them with moustaches and turbans à la Chumbak, the brand. Write to her at thegoodlife@livemint.com. RG, good discussion! It reminds me of Jared Diamond’s Guns, Germs, Steel book. The opening dialog between Yali (New Guinea guy) and JD where Yali asks why the West had so much more “cargo” (highly ironic for a post about luggage!). I guess India, no different than any other foreign dominated power, even after independence thrived on imported Western technology. But your point – luxury is a choice not necessity – is well taken, why does the Indian affluent still prefer Western luxury brands? Maybe aspiration? Maybe coming of age? Very interesting topic. Vinay I loved that book! I guess in this case my reply to Yali is that Indian “cargo” isn’t marketed properly. I guess even in luxury one has to distinguish between the plebian luxury e.g. clothes and personal effects and objet-esque luxury like art or wine that are hard to find collector’s items. I think Shoba wrote a piece about khadi some time back, I guess that’s our way in, our “official entry foreign fashion” to the Oscars aka Fashion Week. But then that prompts the question – when do we get out of “foreign films” and become mainstream? Not, I hope, with a Slumdog entry! Hi V. As for this, I say that it is during my ‘misguided’ youth. But your point is a larger one– about how Indians are wary of asserting their cultural identity. Forget when you are an immigrant and you have a subconscious pressure to assimilate. Even here in India, my friend, Manish is experimenting with wearing a kurta-pyjama one day a week to office. Why don’t more men do that? Why must we adopt a western identity at work? I don’t know but it is a topic that haunts me. This is an interesting point. I don’t know if shirts and trousers are “Western” anymore. After all, we use the English language and Roman numerals for most of our business dealings anyway, and the shirts and trousers are at least 100 years old (in India and elsewhere). What is really interesting is that I found Indian women happily wearing saris and salwars to work in India (when I visited Bangalore). But again I suppose that is cultural, growing up in India I noticed that the Anglo-Indian women schoolteachers wore skirts or trousers while the locals wore saris and salwars. The male teachers always wore shirts and trousers. The question here is not about the contemporary default – shirts and trousers – but about the choice of luxury. I guess in this space one is free to exercise their choice among silver cuff links or Indian gold chain.